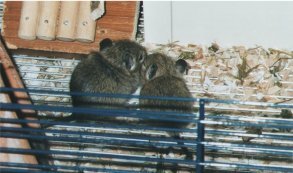 In the wild degus can at most reach the age of four years. As a pet they become much older. They can become five to eight years old. This difference certainly has to do with the life circumstances, which are often much better in captivity than in the wild. In captivity there is no danger of enemies, there's often better food, and the chance of getting diseases is much less. The age a degu can reach is pretty exceptional, when compared to the ages of other rodents. Most rodents die after about two years.